openEHR is a virtual community working on means of turning health data from the physical form into electronic form and ensuring universal interoperability among all forms of electronic data. The primary focus of its endeavour is on electronic health records (EHR) and related systems. The archetype specification is now an ISO standard (ISO 13606-Part 2). A key innovation in the openEHR framework is to leave all specification of clinical information out of the information model (also known as "reference model"). Reference Model - A very stable information model that defines the logical structures of EHR and demographic data. All EHR data in any openEHR system obey this reference model. 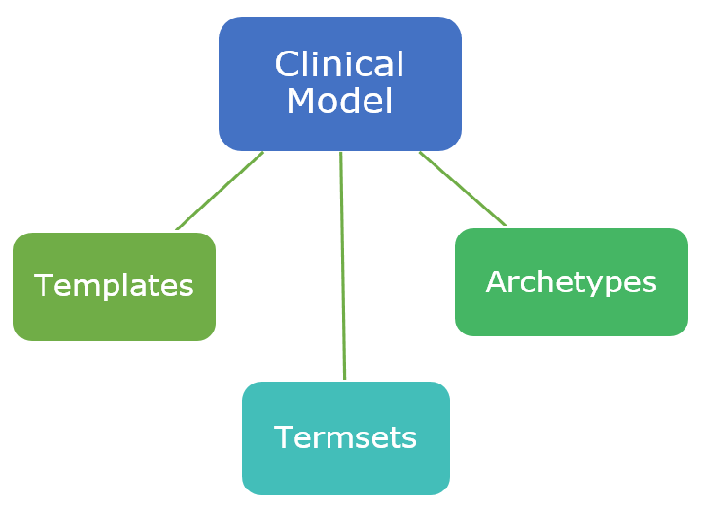 The clinical model comprises of archetypes and templates. These are bound to terminology subsets or termsets. Archetypes - Library of data points/data groups that are independent of particular use. These archetypes can be modelled by clinical professionals or health informatics experts without any technological knowledge of the final EHR systems. Templates - Data-points and data-groups that are assembled into context-specific data sets.It could be the data for a form, a particular message, or a document. Termsets - The openEHR approach also allows to make use of external health terminologies, such as SNOMED CT, LOINC and ICD in the modelling process. The openEHR Clinical Knowledge Manager (CKM) is an online international library of openEHR archetypes. It contains about 500 archetypes. In practice, it is a system for collaborative development, management and publishing of a wide range of clinical knowledge resources including archetypes, templates and terminology subsets (termsets). The essential outcome of the openEHR approach is systems and tools for computing with health information at a semantic level, thus enabling true analytic functions like decision support, and research querying.